Now that the customary exchange of Christmas gifts has passed, we have decided which gifts received are worthy of our keeping, which gifts can be “temporarily” put aside, and which are “unwanted” that can be given away — be given a “new life”: perhaps re-gifted to a friend or relative, donated to a charity, or become a “prize” in a fund-raiser raffle! Of the gifts we choose to keep, we select which ones should hold a prominent place of display and which will be kept in a place of easy access. Of the gifts we put aside, we determine which will be put in the attic or basement for “the short term” – and the remainder stored off-site for “the long term”. Those gifts we placed “out of sight” can come back to haunt us: what were we thinking? Why did we hold on to these unused gifts for so many years? What do we do with them now? Whether you received just one, a few, or many gifts, each gift calls you to make an assessment and a resolution. What will you do with each gift? 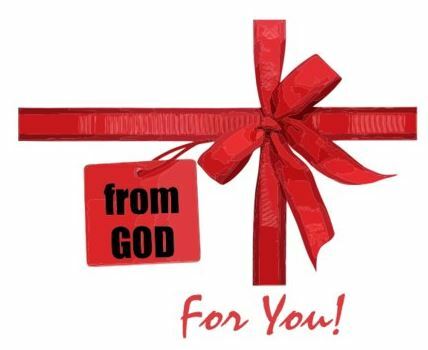 As Christians, we believe that God has blessed us in many ways with His many gifts; among these are the gift of life itself and the opportunity for eternal life with Him. We are especially reminded at Christmas that our Creator Father God gave humanity the gift of His Son Jesus Christ so that we can know Him personally and intimately – to be in continual communion with Him. This is the greatest gift to be offered to us, freely given and undeserved, out of eternal love for us created in His image! Once we realize the incomprehensible magnitude of this gift, we are confronted with the assessment question: what do I do now? In a recent meeting of our Men’s Ministry group, we speculated on the one question that Father God might ask of us at Judgment Day. The one proposed question that stayed with me is this: “What have you done with the gift of my Son?” Truly a sobering question and one that compels me to assess my relationship with God. Where have I placed this gift of God in my life? Have I put this gift aside and neglected it? Or have I embraced, honored, and treasured this gift? Have I shared this gift of His Son with others? The secular-atheist world has rejected it, marginalized it, and strives to dispose of it; let not any one of us be found on that side of the assessment! With the new calendar year upon us, the secular world suggests that we make “New Year’s Resolutions” such as a new diet or weight-loss program, learning another language or skill. As believers in God, let us consider a resolution that really matters — one that truly creates a new life with eternal consequences: resolve to not only know more about God, but get to know Him personally and intimately. Once you have tasted and seen the goodness of the Lord, you will abandon everything inferior. So open this gift! Eagerly embrace the gift your heart has been seeking — the unique plan God has called you to become and to accomplish in this life; this is your divine purpose and mission. Do not put this gift aside or store it hidden away — and then forgotten! What other gift could enable and empower you to become greater than your perceived self-image, to become more Christ-like, and then partner with your heavenly Father in furthering the restoration of His will “on earth as it is in heaven”!